Due to unforeseen circumstances, I had to miss the first of New York City Ballet’s programs (Divertimento No. 15, Zakouski, Pulcinella Variations, Tschaikovsky Pas De Deux, and Symphony in Three Movements) in Washington, DC. Thankfully, I was able to see the second program, a Jerome Robbins tribute. The Robbins program was solid, and making an educated guess, may well have been the stronger of the two programs. Of the three works presented, I preferred Glass Pieces, which opened the evening on a high note. This work, which premiered in 1983, pulses with life as does the equally compelling music by Philip Glass. There’s a Robbins tribute, obviously, because of his contributions not only to NYCB, but also to dance in general. He was a master choreographer and creative genius, and Glass Pieces attractively shows off his skills. The fact that Glass Pieces looks fresh and contemporary today, more than 30 years after its debut, is striking. Then again, creating works that stand the test of time is a hallmark of a truly great choreographer, and Robbins was truly great. There’s much to admire about Glass Pieces. The corps de ballet ambulate in multi-colored leotards and tights. Their expressions are distant but determined as they charge forth, criss-crossing the stage like a crowd in the center of a large city. Behind them, like graph paper, is a white scrim with dark grid lines. Is there a geometrical formula being worked out? I don’t know, and it doesn’t matter. Couples wearing pale uniform shades appear within the mass. They go from being somewhat difficult to discern among the throng to being alone as the crowd members return to the wings. The emergence of the three lead couples in the work’s initial section, to Glass’s Rubric, feels more like a shift in focus, though, than anyone being abandoned. The trio of pairs stretch in lunges that stay low to the ground but propel them forward with a kick. In the second section, to Glass’s Facades, the mood changes, and the relentless nature of the music grows more haunting. At the back of the stage ballerinas in deep shadow look like tiny soldier dolls marching in a line. Their silhouettes are black, their precision enviable, their movement so oddly interesting, yet simple. I often found myself drawn to watching the mesmerizing corps rather than the stoic duet that begins in front of them (danced by Maria Kowroski and Russell Janzen). The bodies of the dancers in the corps flexibly bounce like rubber bands, up and down. The moving line they form magically ripples and folds and reconstitutes itself again and again. In the final section, to an excerpt from Glass’s opera Akhnaten, the mood and music shift once more. The dancing becomes more aggressive and excitement builds. The choreography plays with levels. Dancers jump up straight as an arrow, they walk in an uneven gait. Steps and skips swell. As for Fancy Free, the choreography is undeniably charming. In contrast to the stark modernism of Glass Pieces, Fancy Free, which premiered in 1944, focuses on storytelling. No words are uttered, yet it’s perfectly clear what takes place as the the three sailors on shore leave hit the town for a night of carousing. Roman Mejia, Harrison Coll, and Sebastian Villarini-Velez, all from NYCB’s corps, embodied the three fun-loving sailors well, but I couldn’t help but re-live prior performances in which certain famous male dancers pumped even more vigor and humor into the same roles. I felt similarly about the so-called “passers-by” (Mary Elizabeth Sell, Sterling Hyltin, and Miriam Miller). These dancers performed well, too, especially Hyltin, who is a principal dancer, but not so well that I forgot more memorable previous performances by others. Fancy Free calls for acting talent, and the choreography has a seductive air of ease. In the midst of the current Me Too movement, however, some scenes that were meant to be funny may now seem distasteful. 1944 is a world away from the present time, and Fancy Free reflects that. The Four Seasons, with music by Giuseppi Verdi, which premiered in 1979, shows a more classical side of Robbins, but there’s abundant humor that keeps it light. The dancers of Winter, wearing white, of course, shiver, huddle, and rub their hands together for warmth. Indiana Woodward danced with impressive confidence and all the luster of a sparkling snowflake. DC has been stuck in winter although the calendar says it’s spring, so I longed for the warmer dancing of Spring. In the bright yellowish green of a new shoot, dancers jump with their legs bent beneath them like eager frogs. Sara Means and Tyler Angle were appropriately perky. Summer, on this evening, was my favorite. Ashley Laracey and Taylor Stanley are a comely couple, and they grabbed me from the moment they hit the stage. I noticed an imperfectly executed lift, but they earned my admiration anyway. In Fall, Daniel Ulbricht, with his fawn horns, was the one I couldn’t peel my eyes away from. He trotted and leapt with amazing effervescent nimbleness. 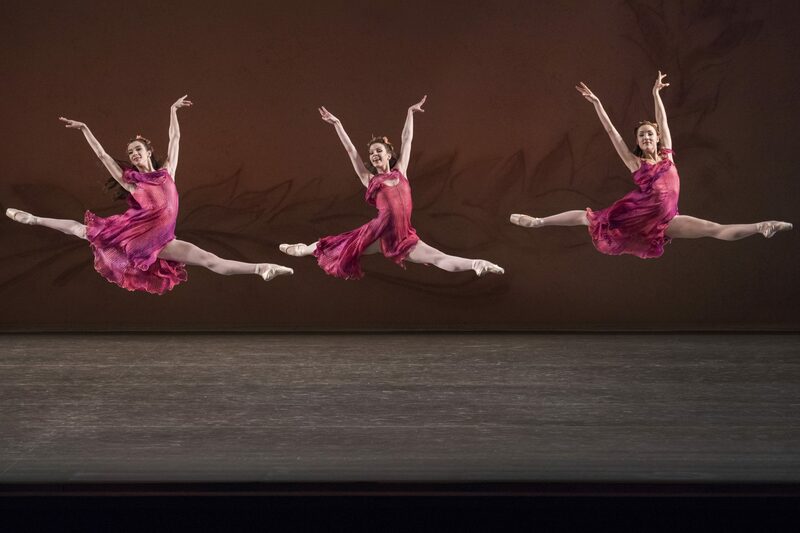 The Robbins program reminded anyone who needed a reminder why Robbins is an important choreographer. The versatility of the three works performed by NYCB really is just the tip of the iceberg for this choreographic great. I hope people will be celebrating the bicentennial of his birth in another one hundred years.